Do you live in Logan or Brisbane Southside and have an annoying tree stump left behind after a tree removal? Let Oasis Tree Management remove it for you with our affordable, reliable stump grinding service. Not only are old tree stumps unattractive, they take up precious space and they are a trip hazard too. Old stumps can attract pests and insects like white ants and termites who are looking for somewhere to set up a nest, and get an easy meal. Why risk having these uninvited pests invade your backyard or home? Not only do stumps harbour pests, they can also regenerate new tree growth causing more problems and expense further down the track. Professional stump grinding by Oasis Tree Management removes the visible part of the stump to about 5 centimeters below ground level, so no more unattractive and annoying stump getting in your way, your garden can now be landscaped as you wish! 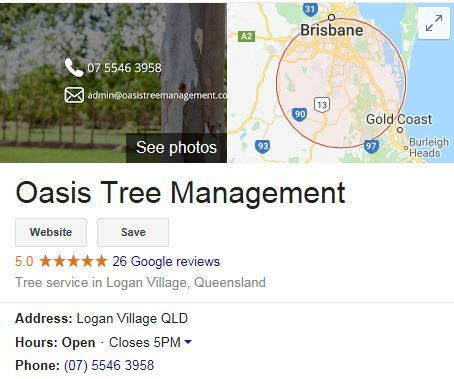 As part of our tree removal services, our team at Oasis Tree Management can remove stumps from your yard by using our heavy duty Stump Grinder. The teeth on our machine can mulch the stump to about 5 centimeters below ground level, in as quick as 15 minutes depending on the size of the stump. Why waste your days off and do all the back-breaking work trying to get rid of that ugly eyesore yourself? Stump grinding should only be performed by experienced professionals, as it requires the correct equipment and expertise to ensure it is done correctly and safely. Let our expert arborists get rid of it for you and make sure it’s done right. Getting a quote is simple, as long as you have the approximate diameter of the stump, the location details in Brisbane, and if there are any objects surrounding it (shed, concrete slab, retaining wall etc) we will be able to give you a quote over the phone.